Our monthly care plans provide you with the peace of mind that you have an expert in your corner. We protect your website investment against security threats and software bugs and keep it optimized and running smoothly. All plans include email support for questions and advanced plans include hours to put us to work on any small content changes that arise. Did we mention all plans also include free hosting? We treat your website like it was our own, with daily backups and a set of human eyes checking on your site regularly, especially after updates. We make sure your WordPress core software, plugins and themes stay up to date to avoid security vulnerabilities. Daily Backups and Quick Restores keep your website protected if anything goes wrong. You can remain on your current host, or if your website needs a good home, we include hosting. Stay informed about how many visits you're getting and what pages are popular. No long-term contract. Cancel or switch plans at anytime. Do monthly support hours roll over? The monthly time is there for you every month to reserve your place in our queue and our resources, therefore it does not rollover. The whole purpose of our Care Plans is preventative care, so we hope to prevent anything from happening. However, in the case your website gets rolled into the ER, we will be there right by it’s side communicating with the web hosting on your behalf. We cannot promise your website will not be hacked but can promise we will do everything in our power to prevent it, as well as assist in the restoration and cleanup of the website with one of our backups. If you have website requests that require more than your dedicated monthly time, we will submit a quote for you to approve separately from your plan. We provide additional hours at $75 per hour. You may just want some tasks to be re-prioritized, or re-scheduled for the following month. If it's a large request, let's hop on the phone and talk it through so that we can send you a proposed estimate and timeline. Do you offer hosting for my site? Yes! We have recently added hosting as an option for all of our Website Care Plan customers at no additional cost. You do not need to use our hosting to be on a Website Care Plan. Do I need to pay for my ongoing software licenses? If your website uses premium plugins that are not in our list of licenses we cover for you, then you will be responsible for renewing your licenses so we can keep your website up to date. We will alert you if you have any licenses about to expire. If you are a new client, we will advise as to any premium license requirements in your Website Evaluation. My website was not built by City Dock Digital, can I still be on a Care Plan? Yes! As long as your website was built on WordPress. All websites must have a clean bill of health before joining, so we require new clients to have a Website Evaluation. 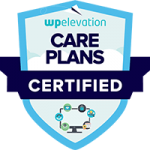 This prepares your site for a Care Plan and allows us to become familiar with your website, how it was built, and any potential issues that can arise. With the evaluation, we will take a full backup and perform all the software updates and monitoring. Most importantly, we will make a list of issues to fix and suggestions for improvement needed in order to proceed with the website on a monthly plan. The Website Evaluation includes 2 hours of updates. If your website requires extensive work beyond this scope, we'll discuss options with you before any work is started. Absolutely. We are all about a relationship with you and your website, so we would hate to see you go but we know financial needs weigh on many decisions and don’t want to lock anyone in. Request a cancellation via email to hello@citydockdigital.com, and we will immediately stop the next payment.